These small, feather-light French sponge cakes, believed to have originated in the town of Commercy in Lorraine, were made famous by Marcel Proust, who sang their praises in his novel Remembrance of Things Past. Madeleines are delicious dipped in coffee or tea. In a small saucepan over medium heat, melt the 6 Tbs. (3⁄4 stick) butter until it starts to brown and gives off a nutty aroma, about 3 minutes. Strain through a fine sieve and set aside to cool. Over a sheet of waxed paper, sift together the flour and baking powder; set aside. 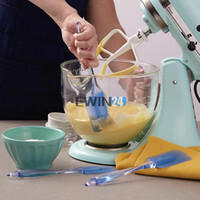 In the bowl of an electric mixer fitted with the whisk attachment, beat the eggs on high speed until pale yellow and thick, about 2 minutes. Add the sugar and honey and beat until thick, about 5 minutes. Reduce the speed to low. Gradually add the flour mixture, then apple puree and melted butter and beat until well blended. Cover the bowl with plastic wrap. Chill the batter for 2 hours. Preheat an oven to 375ºF. Butter madeleine mold and place on a baking sheet. Whisk the batter briefly. Fill each prepared well three-fourths full of batter. Bake until the madeleines are golden brown, 10 to 12 minutes. Immediately invert the mold onto a wire rack and remove the madeleines, using a toothpick to gently loosen them, if needed. Let the mold and the baking sheet cool completely, then repeat with more butter, flour and the remaining batter. These look great–perfect for the Jewish holidays, too! These are perfect for fall! They are so lovely and the combination of apple and honey in a madeleine sounds delicious! Your madeleines are beautiful and the flavors are wonderful together. Perfect for a Rosh Hashanah celebration! I LOVE that you did maple and honey madeleines instead of traditional ones. Your pictures are absolutely STUNNING! Buzzed! By far my favorite pictures of the day. So lovely. This looks too good to eat!